It’s a well known fact: first impressions matter! From first dates to job interviews, being manicured and well put together goes a long way toward impressing a prospective employer or romantic interest. Your front door is no different. Give your front door a makeover just in time for the holidays. Overgrown lawn, chipped paint and rusty hardware: they don’t make for a very good first impression. Realtors across the country stress that curb appeal is one of the most important aspects in selling a house. But why wait to sell to give your front door some much-needed TLC? Rain, hail or shine, the elements are never kind to the outside of our homes. Here are three easy ways to instantly give your front door some curb appeal — just enough for a quick weekend project. It’s incredible what a little paint will do for your front door. This is one area where I believe the bolder, the better. Fancy yourself some cerulean blue? Maybe you’ve got an orange crush? Is big apple red more your jam? Pick a bright colour you love and get your paintbrushes out. A front door is quick to paint, so you can easily fix your mistakes if you have a change of heart. I won’t lie: I have a soft spot for classic brass hardware. 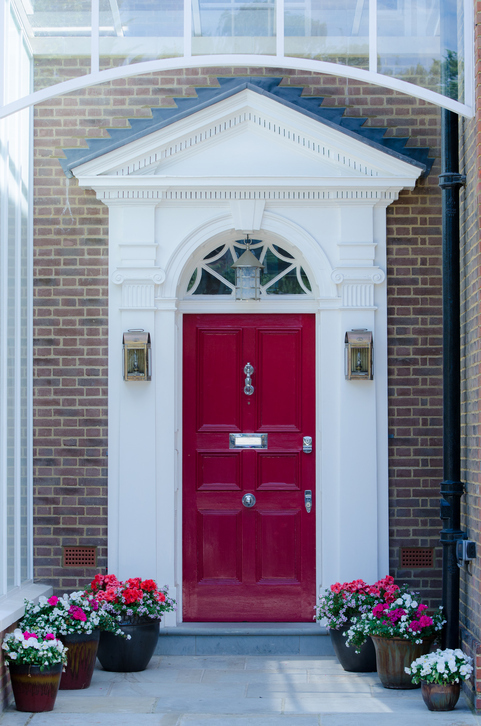 To me, the ideal front door has the bright colour mentioned above, plus a brass door handle, letterbox and a quirky door-knocker — at the very least! I love door-knockers that tell a little something about the homeowners. Personally, I’m likely to go for a brass lobster or boat-anchor knocker. If brass lobsters aren’t your cup of tea (I forgive you), a good rule of thumb for hardware is simple, elegant, timeless and tetanus-free. You never want your front porch to look like prisoners are trying to escape from Alcatraz (i.e. step away from the ultra-bright neon lighting). You also don’t want grandma to trip and fall because the path from your door to the car looks like a dine-in-the-dark restaurant. A lantern or sconce that casts a soft warm light is perfect for the front door. For special events, you can even line some tall lanterns leading to the front door to go for a dramatic effect! SICO is a registered trademark of PPG Architectural Finishes, Inc. © 2017 PPG Industries, Inc. All Rights Reserved.